Get a free beer mug with any ticket purchase starting July 1! Get a discount for the exclusive towel with any ticket purchase! 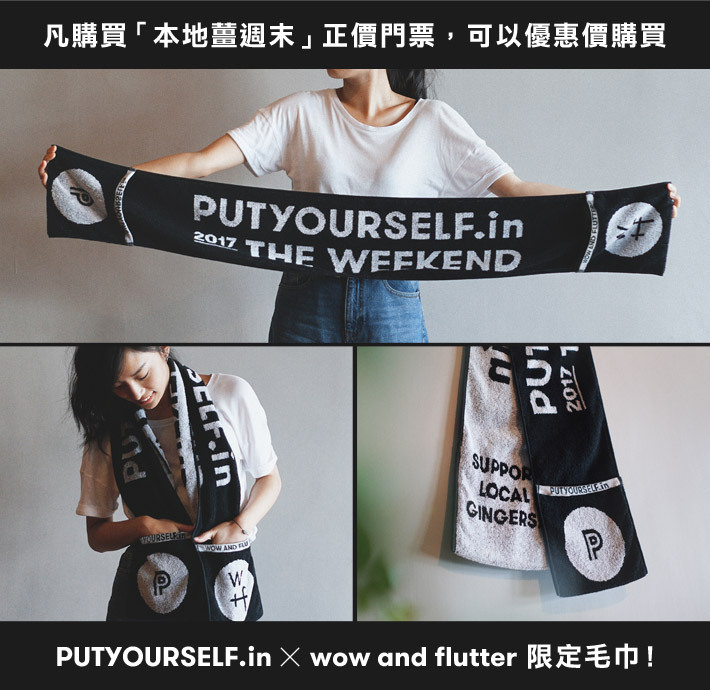 Organised by The Sun Entertainment Concert, a 89268 project, “wow and flutter presents THE WEEKEND” is a 3-days festival comprising local music, art installation, unique local foods, craft market, and family activities. It gathers bands from around Hong Kong to perform on four different stages – namely Hong Kong, Kowloon, New Territories, The Islands and local talents and artists to participate and exhibit in different ways. 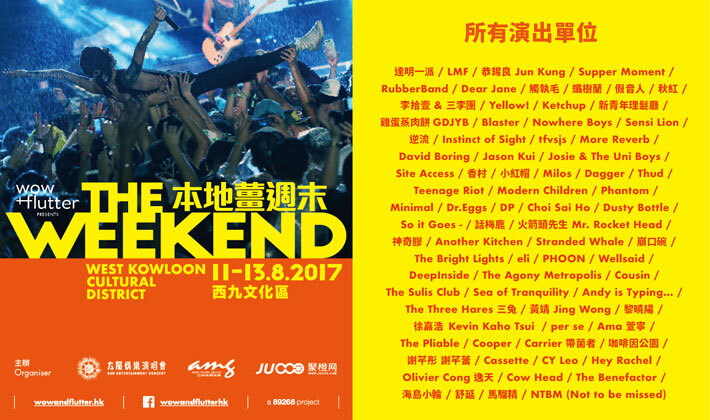 The WEEKEND will take place on 11th to 13th August 2017 at West Kowloon Cultural District. 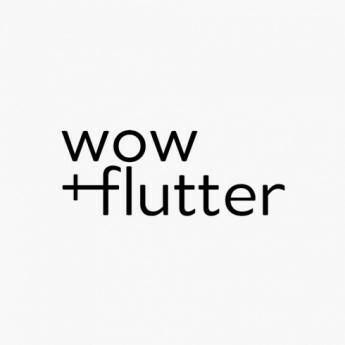 For more information, please visit wow and flutter WEEKEND Facebook and wow and flutter WEEKEND website. For Online Payment, you may pay through PayPal. Once your payment is made successfully, you will receive the electronic ticket through your registered email at Putyourself.in. When you choose to pay through Offline Payment, you will received an email from Putyourself.in after you ordered your ticket, that email will provide you with details for offline transfer. (If you do not receive this email after ticket order, please contact look@putyourself.in for enquiry.) Please make the offline payment within three (3) working days (excluding weekends) and send the payment proof with your registered name and email to "ticketing@wowandflutter.hk". The organizer will issue the electronic tickets to you within two (2) to three (3) working days once your payment is confirmed. If the organizer do not receive your payment detail within three (3) working days after the booking pending email is issued, the organizer reserves the rights to cancel your reservation. - 每個QR碼只能掃瞄一次，並只限一人使用 Each QR code could only be scanned one, and could only be used by one person. - 每位入場人士均獲發活動手帶一條並由大會人員為入場人士戴上手腕，如活動手帶一經破壞，即喪失入場資格。活動手帶不可轉讓予他人使用。入場人士須確保活動手帶之完整。「週末票」人士將於首次進場時獲發活動手帶，同一活動手帶需要連續使用三天。Each participant will be given a wristband upon entry. The wristband must be kept on at all times during the event, please take good care of the wristband. Entry will be denied if wristband is lost or damaged. 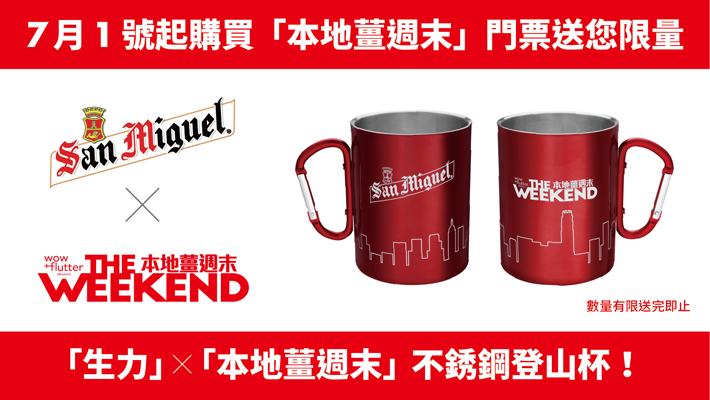 “Weekend” Tickets holder will be given a wristband on the first entry, and to be used for all 3-days. - 如您收不到任何確認電郵，請電郵至 look@putyourself.in，大會將協助進行調查和確認，並再次重新發送確認電郵給您。Please email look@putyourself.in if you do not receive a confirmation email after ticket purchase. - 如果在購票途中需要技術支援或遇上技術問題， 請將姓名、電話和問題，電郵至 hello@wowandflutter.hk， 我們會於一個工作天內回覆您。Should you need any technical assistance during purchase, please email your name, phone number, and question to hello@wowandflutter.hk. We will response within 1 business day. - 如遇天雨或天文台發出之惡劣天氣訊號等，活動仍然照常舉行，不設退票。主辦將按天氣狀況適當調動活動安排，並將就相關調動發出通知。持票者需留意通知。The festival will not be cancelled due to inclement weather, please note that tickets will not be refunded. Organiser will adjust the event programme according to weather condition. Participants should pay attention to announcements. - 可攜帶寵物入場， 每人可攜帶最多2頭寵物入場。持票人士須負責看管其寵物，若遇寵物遺失、寵物襲擊/傷害他人或動物等，持票者須付上責任。攜來狗隻必須已植入晶片、注射預防狂犬病疫苗及領牌，並以狗帶牽引，倘犬隻具攻擊性，應戴上口罩。Pets are welcomed at the event, each participant can bring up to 2 pets. Pet owner has full responsibility for controlling and guarding the pet. Pet owners has full liability for any loss, damage and physical injury of other people and pets caused by the misbehaviour of their pet. All dogs must be implanted with microchip, vaccinated and holding valid licenses. Dogs must be leashed at all times, and dangerous dogs must be muffled. - 門票只適用於指定持有人 Ticket valid to designated participant only. - 門票不得轉讓 Tickets are not transferable. - 入場人士需出示有效的身份証明文件以作核對之用 Participant may be required to show valid identification for entry. - 如持學生票者未能出示有效全日制學生証明文件，或獲証實並非全日制學生，將需要即場支付正價票價之差額，方可進場 Should a student pass holder unable to present a valid full-time student card, or is proved to be non-student, he or she will be required to pay the fare difference for entry. - 六歲或以下及身高110厘米或以下的兒童必須在家長陪同下方能免費入場 Children under 6 years old and under 110cm height must be accompanied by adults for entry. - 一位家長最多可帶同兩位六歲或以下兒童入場 One adult participant can bring up to 2 children under 6 years old to the festival. - 門票一經售出，恕不退換或退款 Tickets are non-exchangeable or non-refundable. - 禁止攜帶單車入場 Bikes are not allowed. - 請勿攜帶外來食品、飲品進場 Please do not bring outside food or drinks. - 經任何方式擁有他人門票者，可能會被拒絕入場，並不會安排退款或補償 Should tickets be found to be transferred, entry will be denied without any compensation or refund. - 場內消費將以指定電子交易系統進行，不設現金交易 All transactions within the venue will be done via designated electronic system. No cash will be accepted. - 倘門票上的資料被刪去或經過塗改，又或門票遭損毀、污損或變得殘缺不全，持票人可能不獲准入場 If any information was deleted or amended on the ticket, or ticket has been damaged or spoiled, ticket-holder may not be permitted for entry. - 所有入場人士均需遵守大會場內規則及在場工作人員之指示，如發現違反規則，大會有權拒絕相關人士繼續參與wow and flutter WEEKEND活動及被勸喻離場 All participants must adhere to all rules and regulation within the venue and follow guidelines by our staff. Violators may be asked to leave the event. - 大會擁有修改、取消活動及內容之一切權利 Organiser reserves all rights to change or cancel any part of the event. 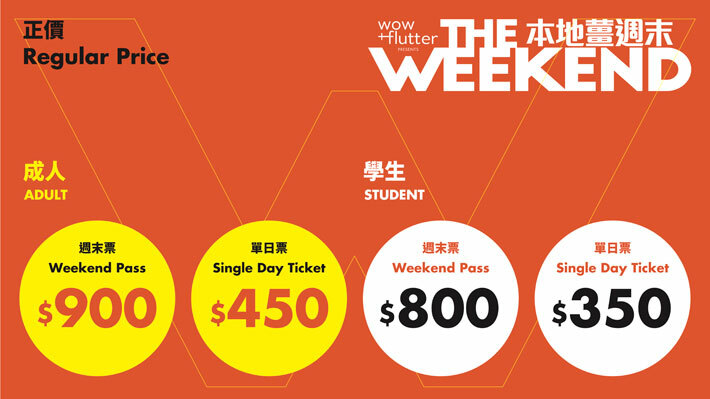 - 如有任何爭議 wow and flutter presents THE WEEKEND保留最終決定權 wow and flutter presents THE WEEKEND reserves the right to all final decision.